Before scheduling an appointment, please make sure to review our policies and expectations. To view the guidelines, please click HERE. USM students can use our self-service online scheduling tool to schedule an appointment via the "MyUSM" portal. 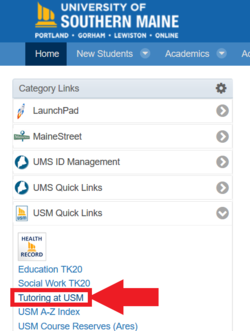 Once you log into MyUSM, on the left side halfway down is "USM Quick Links". There you will see "Tutoring at USM". 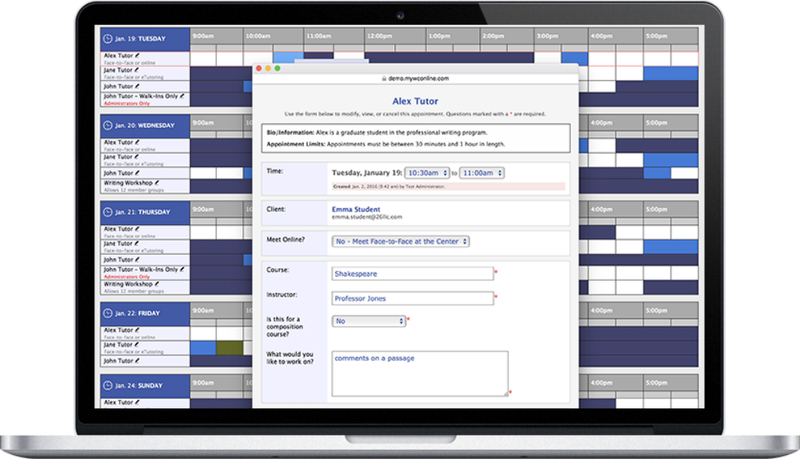 Since you would already be logged in using your maine.edu information, you will then be brought directly into the scheduling system! If new to the system, you will need to create an account. MAKE SURE TO DO SO WITH YOUR MAINESTREET EMAIL AND PASSWORD. To view a "how to" document with screen shots, please click HERE. NOTE: If you have an account and did not use your MaineStreet information, you must change your account information to change MaineStreet. Students can choose from appointments on all three USM campuses, and also request that appointments be delivered online. For more information on a what a live, online appointment would be like, please click HERE. All appointments are 50 minutes in length to allow the tutor 10 minutes to prepare for the next appointment. Please feel free to drop by The Learning Commons in Portland or Gorham, or the Writing Center at Lewiston-Auburn College. If there is a tutor available, he or she will be happy to work with you. It is always best, though, to plan ahead and schedule an appointment in advance.This is especially true toward the end of the semester. If you need assistance, please call The Learning Commons at 207-780-4228.